Fallout Shelter is a widely popular mobile game in which the player takes on the role of a vault administrator from the popular Fallout series. Gameplay mainly consists of players building and maintaining their vault. Gathering resources, fighting fires, defending the vault from enemies, and exploring the wasteland are all parts of the experience. If you are looking for a mobile version of the popular console games, you have come to the wrong place. This game is mobile, thru and thru, and rightfully so. The gameplay is not meant to be something the player actively engages, or so it seems. Periodic check backs are more than enough to keep the game flowing. As a matter of fact, if the player decides to sit and stare at the screen they will be introduced to the fine art of waiting. Unless you are attempting to achieve a Zen like state, it’s probably best to collect your resources and pocked your device for another 10 minutes. If you do decide to zone out on the screen however, Fallout Shelter does not force the player to sit idle for hours, or DAYS at a time. The longest the player will be waiting to do something is minutes at most. Many players and reviewers alike, have criticized the game for being slow, boring, and monotonous. To them I say, QQ moar, it is a mobile game. I don’t disagree that the game definitely has some pacing issues, but from a design point of view it hits the mobile game mark perfectly. The controls are simple, the pace is not hectic and allows for periodic play sessions throughout the day, the gameplay is forgiving, and it has a well thought-out monetary system. On top of that, it is MOBILE, and it’s FREE. I find it hard to complain about something that was handed to me for absolutely nothing, but that might just be me. This first image shows the game as the player will typically see it. The layout of the players vault is shown and the selected room is denoted by the green brackets in the corners (as seen on the far right lower room). The top of the screen shows the player information about their vault. 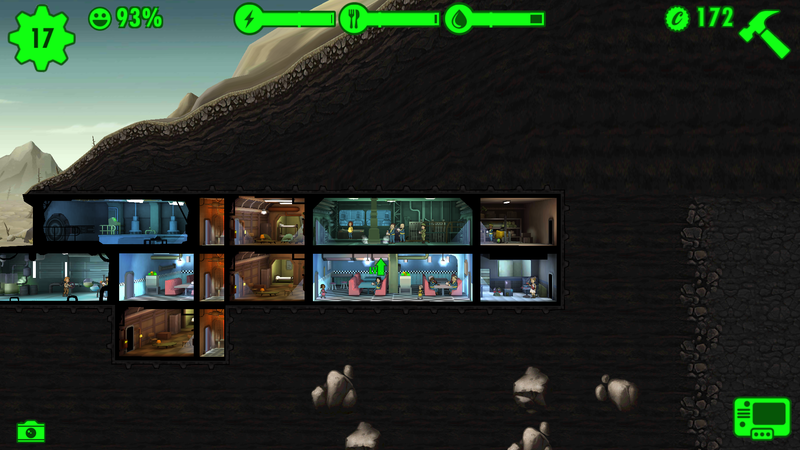 From left to right, the amount of Dwellers (people) they have in the vault, the dweller happiness, electricity, food, water, caps, and level up selection icon. The bottom of the screen holds most of the player interaction options. Again from left to right, the clipboard shows stats about the currently selected room, the camera allows the player to take a screenshot, the room name, SPECIAL indicator, room production rate, next production time, rush button, and the main option button. 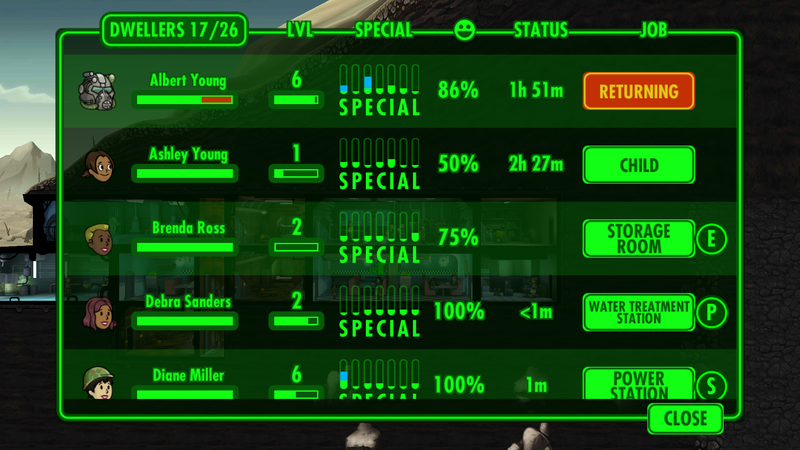 Other screens allow the player to select individual dwellers to see their stats and their current actions. This particular dweller is out exploring the wasteland for gear and caps. The player can also opt to see all of the dwellers they have in a sort of roster list. It displays the dwellers name, level, SPECIAL, happiness, current work status, and what their job is. The strategies in this game are very simple and yet somewhat unintuitive at the same time. Here are a few examples of strategies that will aid you while you are playing. Challenges give caps, but they can also provide the user with a lunch pail. The lunch pail can have many strong and rare items in it which can greatly benefit the player. Completing challenges eliminates them from the challenge board and allows new challenges to be drawn up. The more you complete, the higher your chances are of getting a challenge that rewards a lunch pail. Stack characters in rooms during hazards. When a fire breaks out or radroaches start invading your compound don’t just let the dwellers who are in the room handle it. Max out the number of dwellers in that area to help eliminate the problem as quickly as possible. You can also cycle out low health Dwellers with others to prevent unnecessary death and resurrection cost. Don’t rush if the risk is over 40%. It seems as if the percent calculations for rushing production are not completely fair. If possible avoid every using rush when the percent is over 40%. It is almost guaranteed to fail. That being said, a really good time to rush is right after a standard production cycle. The risk percent drops and the player can usually get a two for one bonus on production. Assign dwellers to their best suited task. Use the SPECIAL meters to gauge the players best task. If they have more strength than any other stat, then they should be manning the power generators. Each room has a letter identifier that shows what it requires to function. Pick the best characters for each room and you will be producing more resources faster. This can greatly ease the difficult of managing the systems of the game. Before you proceed to dig your way down, you should focus on building as far horizontally as you possibly can. If you place similar rooms next to each other, they will merge into larger versions of themselves, increasing the amount of workers allowed in the room and increasing the productivity of the facility. If you caps permit, you should try merging level one facilities when placing them. Just make sure that you have the room maxed out before you expand. NOTE: In order for rooms to merge they must also be the same level. You cannot merge a level 1 kitchen with a level 2 kitchen, if they are adjacent and you make them both level 2, they will merge. You should always have at least one person out exploring the wasteland. This is a very effective way of getting gear and caps. Just be aware, the Dweller who is exploring takes half the time they spent exploring to return. If they were out for an hour, they will take 30 minutes to return. Once they start facing enemies they can’t kill, it is typically a good idea to turn around. Otherwise you will be paying to revive them, which is never fun. Due to the nature of the game there are not a lot of dynamics that occur during gameplay. One dynamic that is usable though is during a raid. When a raid occurs the raiders will walk through the vault rooms sequentially. They stop in any room that is occupied. One simple tactic to ease the danger of a raider attack is to leave one person in each top level room, including the front door. The raiders will stop in every room spending time there to loot and pillage. If you move your attacking force into each room as the raiders switch rooms you can effectively force them to walk through each room twice, doubling the amount of damage you deal, which prevents them from reaching further down into the depths of your vault. This game serves its purpose as a reminder of the soon to be epic-ness of Fallout 4. The gameplay itself does not inspire much in regards to design ideas but the menu system they utilized in the game does. 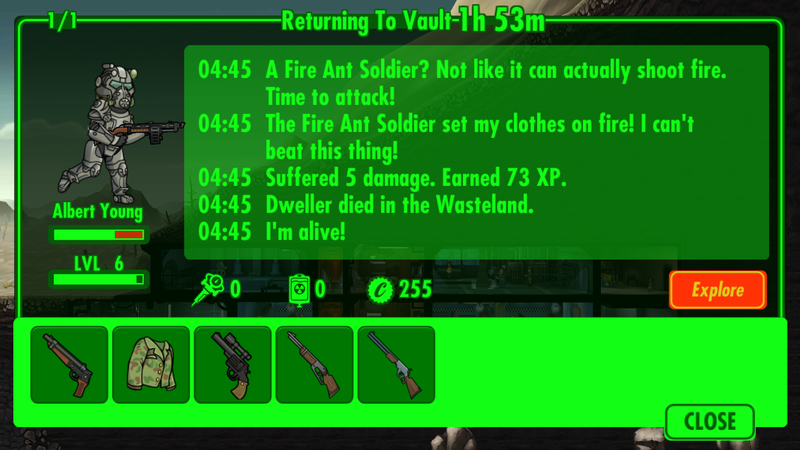 I have thought of a small game where the player just sends units out to retrieve items like the exploration in Fallout Shelter. But with no real reasoning behind sending a person out the idea kind of flops. The 2D and 3D art mix that they used in this game is inspiring though. Additionally, the menu system they created is absolutely astounding. It gives me ideas for other similar types of menu systems. I believe that iconic loading screens and menus help provide a sense of immersion to the player. Using common assets like character faces, in game items, and other such things as button elements in a menu is a great way to subtlety introduce a character to an important aspect of the game without blatantly telling them “LOOK AT THIS”.